Audio For Drinking: "Ain't it a shame how a word can tell you more than words can say"
"Ain't it a shame how a word can tell you more than words can say"
Reawakening the debate of how much a bad band name effects peoples willingness to check out an album, Dr. Dog built upon the buzz of 2005's Easy Beat with the recognizably less lo-fi We All Belong. With a handful of exceptions, Dr. Dog have been one of those rare breed who have been able to shamelessly take queues from the Beatles and Beach Boys and not immediately be met by critics with the neutrality that is often directed to bands doing the sixties pop thing. Like yesterday's entry, it's very much comfort-music, with a laid back playfulness and charm and this young Philly quintet unsurprisingly put on memorable live shows that have made believers out of many. The only criticism I could make is that several songs on the album (including the one I'm posting) had been available on an assortment of EPs released the year prior. It's not a mind-blowing album, but it is mind-blowingly enjoyable and worth the modest hype. 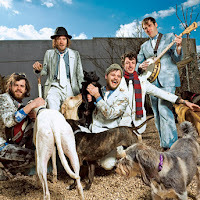 Dr. Dog - download "Ain't It Strange"